It’s been awhile since the last time I wrote but honestly, I have been so insanely busy there was hardly any time. Also, I didn’t feel there was that much to talk about. Until now. Sure, I have things I can update you on – and I will. But right now, I’m about to go on one of my inspirational rants for the sole purpose of the fact I just have it in me right now. And when you have it in you – it’s a waste to not get it out. As most of you know, I was enrolled in community college going through a Nursing Assistant Certification course over Fall quarter. I graduated from the program on December 4th and was suddenly left with the burden of playing the waiting game on when I could take my state test (in which I will be officially certified), the burden of having to find a new job and figuring out how I was going to pay for school Winter quarter with the little to no money I have. On top of that – add the stress of the holidays (and my birthday – so getting old, too) and I had a few meltdowns. Nothing crazy – but just enough for me to want to bury my head in the sand and hide. The unknown is something I have never dealt with very easily. I just like to know everything at all times – but sometimes you just have to have a little faith that everything will work out. Last week I was a bit busy planning a birthday party to even think about what my next step quite was. I didn’t really do any job searching or tried to figure out my life – I was figuring out this party. But come this past Monday it all hit me. I checked my bank account and found I had $27 after buying a few gifts. I had a minor panic attack, told myself to get over it, started looking for seasonal jobs and called Matt’s mom Mary. She is pretty much in charge of an assisted living around the corner from our house and told me that when I was ready to look for a job to call her and she’d make a phone call. Well, long story short, she called me back and another assisted living facility – walking distance from my house – wanted to meet me. So I walked over there to chat, fell in love with the women and felt confident walking away that we would be able to help each other out. However, it was still unknown. I love going over there to help her. And of course she doesn’t have to pay me. But she wanted to because she loves me and knew I was struggling. And I just loved being able to spend the day with her and my brother, baking cookies, and being downright inappropriate. She asked me to run to the bank for her to withdraw some money and told me to get something from Starbucks while I was at it – and during that errand I just had this moment of clarity. Nothing is perfect, everything will be all right. I have my family, my friends, Matt. Everything will be okay. I have an amazing support system and things are tight and tough right now but in the end, everything will be okay. The love and appreciation I was feeling for those in my life made me tear up a bit so I decided to get it together and ordered a latte. Later t oday whilst in the middle of mixing cookie dough my phone rang. It was the woman from the assisted living I had met with yesterday – offering me a job. The job itself will be random, helping in here and there but eventually with reception – all the while getting experience in a facility and getting to the know the residents. They know what I want, what I’m doing, and for absolutely no reason they want to help me out. Well, I’m helping them out, too. It’s just a win win. The stars have aligned and I am forever grateful to them and Mary for helping me out. Things have a way of working themselves out. The future is unknown – it always will be. But have a little faith and maybe the stars will align and the world will surprise you. 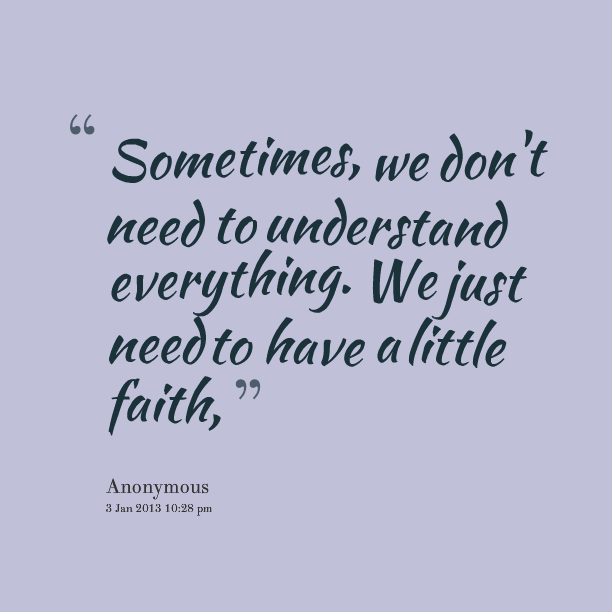 In short – have a little faith. I’m so happy for you! I knew they would end up finding a place for you there but I’m happy it sounds like it will be starting sooner than you originally thought. It’s a Christmas miracle! Having faith and just trusting that things will work out is so hard but I like to think that the universe will only give you what you can handle and you’re forever guided and will not fall down. You just have to have a little faith.